Heat oven to 350° F. Prepare the mold for the water bath. Pour 1/2 cup of the sugar into a small pot; place over medium heat; without moving it too much. Keep an eye on it so it doesn’t burn. Once it melts, remove from heat so that it doesn’t get too dark; if it does, it will taste bitter. Quickly pour into mold you will use for the flan. Distribute caramel evenly until it coats the bottom and sides. Be very careful so you don’t get burned. Mix all the ingredients in blender. Strain and pour mixture into mold with the caramel. Place the flan mold in a water bath and bake for 40 to 45 minutes. Let it cool at room temperature and refrigerate until it’s time to unmold and serve it. You may substitute decaffeinated coffee or 1 cup of cold, strained black coffee for instant coffee. This time I only used half a cup of sugar for the flan because I like to enhance the different flavors of each ingredient, however if desired you may use a little more. 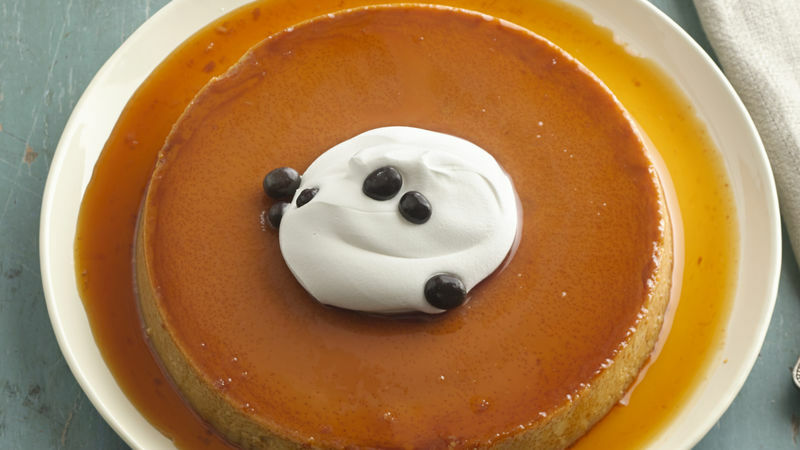 When it comes to inexpensive desserts, flan is every housewife’s favorite. It’s easy to prepare and everyone likes it, plus it will never fail you. Personally, I am always looking to try new flavors every time I prepare it. I have already shared some of them with you, and today I’m preparing this coffee flan. Yes, you’ve read correctly. Coffee flan! It’s a favorite of coffee lovers for its delicious flavor.